Next month, we'll be kicking off a special knit-along in honor of Socktober! 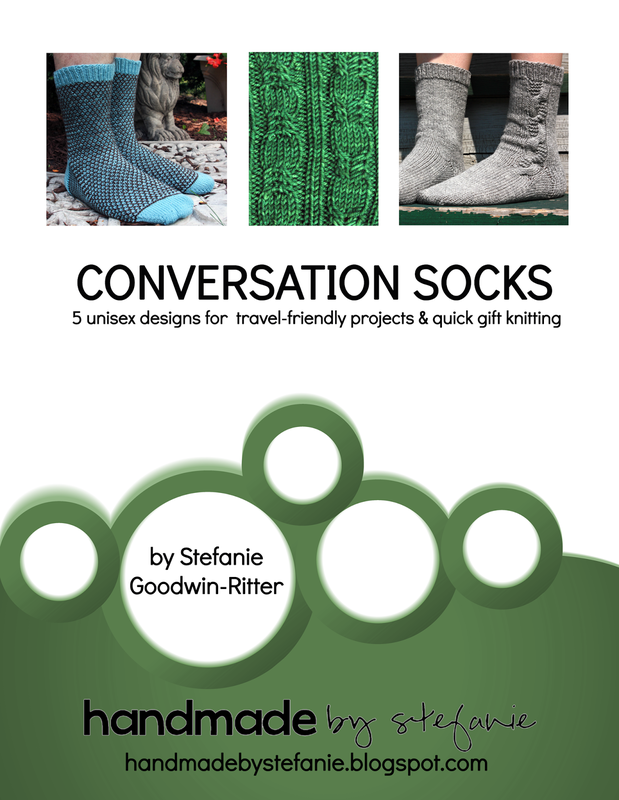 Designer Stefanie Goodwin-Ritter of the Handmade by Stefanie blog recently released a collection of patterns called Conversation Socks which are perfect for knitting on-the-go, and she is offering a special discount on ebook purchases for Knitter's Pride fans now through October 31, 2014 - click here for your coupon! We were able to interview Stefanie for today's blog post; read on to find out more about the inspiration behind Conversation Socks. You'll also get a sneak peek at the final pattern which will be released on Monday, September 29! 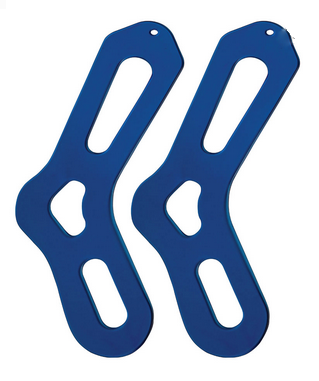 How did Conversation Socks come about? I dreamed up this project because I find myself with less and less time to devote to holiday gift knitting, but I know that my family members love and cherish the gifts I make them, especially socks! By choosing sport weight yarn and US #3 needles, each sock knits up quickly and produces a mid-weight fabric that is nice and toasty without being bulky. Each pattern was created with the express purpose of being simple enough for knitting on-the-go, but interesting enough to keep you engaged. These patterns are perfect for your morning commute, knit night, or a trip out of town! They don't require huge, hard-to-follow charts or incredibly complicated techniques. Instead, they take the basic building blocks that the average knitter has at their disposal to create five designs the whole family will love. What was your first sock design? My first sock design was for Lorna's Laces Yarns, and they are called the Side Swipe Socks - they are now available as a free Ravelry download, in fact! As you can see, even then I was interested in knitting simple socks with interesting little details. What do you love about knitting and designing socks? I love making something that is really useful; while I do love making other small projects such as shawls, hats, and mitts, I do find there are only so many I can realistically wear in a season. But knitted socks are always in heavy rotation for me - I live in Chicago, so as you can imagine, wool socks are essential for winter. Being able to whip up several pairs of sock patterns quickly is high on my list of priorities, and I found that there weren't as many unisex designs out there which fit the bill - which is how this project came to be! What are your favorite tools for sock-knitting? 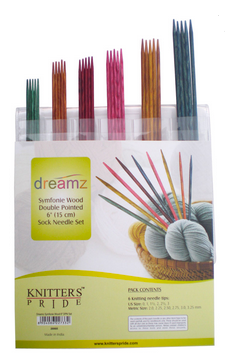 My go-to needles are Dreamz DPNs. The Sock Set was one of the first Knitter's Pride products I ever tried, and it is still my favorite! In fact, all 5 of the Conversation Socks patterns were knit on my trusty US #3 Dreamz DPNs. I am also a huge fan of the sock blockers - they make the finished project look so nice and polished! The final design for Conversation Socks will be out next week. Tell us more! I decided to try something a little different when releasing these patterns: rather than putting them all out at once, I released the first two and offered a "preorder" for the entire ebook at a lower price than it is currently available for. With each pattern that I added, the price went up a little - and everyone who had already purchased the book received automatic updates, so it was really win-win! The final design will be released on Monday, and I was going to increase the price once more, but have since decided to keep it where it currently is ($14 for 5 patterns). The patterns which are already released are (above, from L-R): Air Quotes, Chittery Chattery, Persuasive and Retort. On Monday, September 29, I'll be releasing the final design in the ebook - here is a sneak peek, just for Knitter's Pride fans! 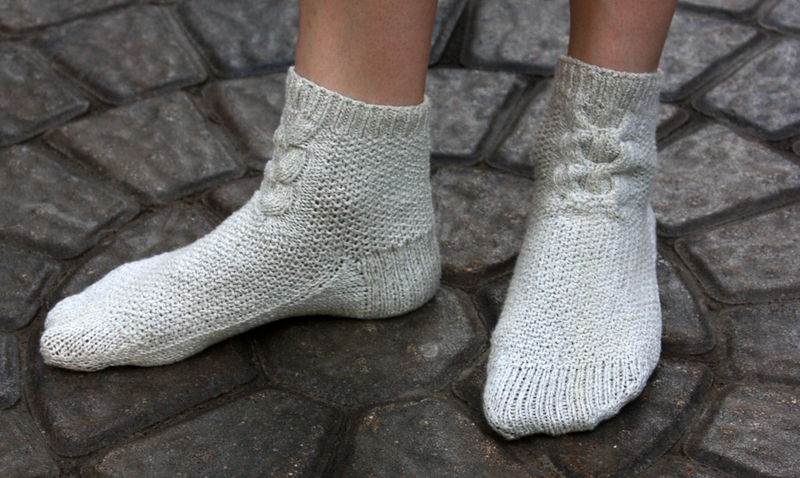 To participate in the KAL, knit any of the Conversation Socks patterns between now and October 31, 2014. Be sure to tag your Ravelry project with KPConvoSocks to be eligible in our prize drawing for a Dreamz DPN Sock Set, Stefanie's favorite sock-knitting needles! You can also use #KPConvoSocks when you share photos on Facebook, Twitter and Instagram! Congratulations to Mikaiyawa, the winner for our September prize drawing! We will contact Mikaiyawa via Ravelry PM to arrange for the delivery of your prize, a Deluxe Trendz Interchangeable set! 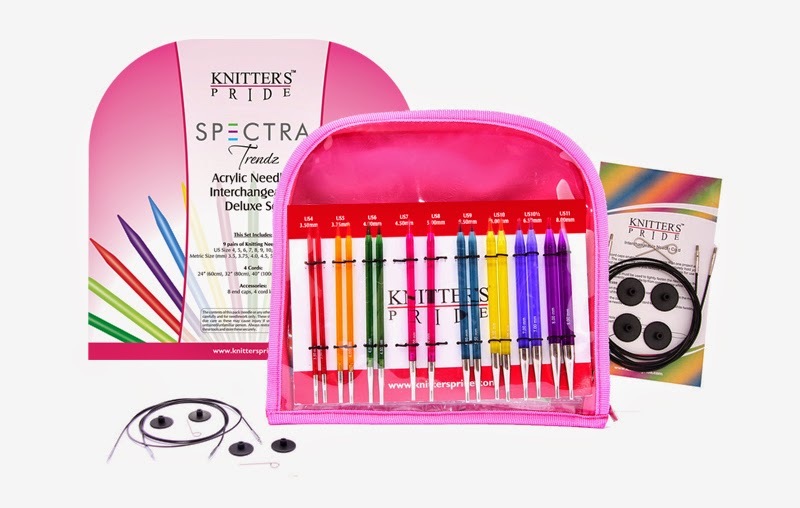 Find Your Perfect Needle with Staci Perry and Knitter's Pride! We're pleased to introduce Find Your Needle, our new three-part video series featuring Staci Perry of VeryPink.com! These short YouTube videos will take you on a journey to find the perfect Knitter's Pride needles to suit your knitting style, project, and yarn. In Episode 1, you'll get a closer look at the various materials we use to make our needles: Nova Platinas (chrome-plated brass), Karbonz (carbon fiber shaft with metal tips), Dreamz & Basix (densified laminated birchwood), Bamboo (Japanese bamboo), and Trendz (acrylic). We also take a look at the unique cuboid shape of the Cubics lines of needles offered by Knitter's Pride. You'll learn how to match these materials to suit your project, yarn or knitting style along the way, thanks to Staci's extensive knitting know-how. In Episode 2, Staci gives you a closer look at the various types of knitting needles we make: Interchangeable Circular Needles, Fixed Circular Needles, Double Pointed Needles (DPNs), and Single-Pointed Needles (straight). Staci shows examples of each type and explains how to match your needle type to your project, yarn and knitting style for maximum effectiveness. Finally, in Episode 3, Staci shares how to use the information from the first two videos in order to choose YOUR perfect needle! She explains the importance of gauge, and why it is a good idea to have a needle set on hand so that you have a full range of needle sizes at your disposal. You'll also get a look at the Comby I & Comby II Sampler sets, which include interchangeable needle tips to try from our most popular lines: Dreamz, Symfonie Cubics, Nova Platina, Nova Platina Cubics, Bamboo and Karbonz. We hope these videos will help you find your perfect Knitter's Pride needle! Should you need help locating your nearest retailer, please visit our website. This month we'd like to give one of our lucky readers a chance to win a set of our new Trendz needles, so we're giving away a Trendz Deluxe Interchangeable Needle Set! To enter tell us which of the needles from Staci's videos you'd like to try most. Don't forget to leave your Ravelry ID so we can contact you if you're the winner. We'll announce the winner on September 26th. Good luck!